Whether you fear death or not, it comes, and at that moment your body becomes twenty-one grams lighter. Is it a person's soul that constitutes those twenty-one grams? Is that weight carried by those who survive us? 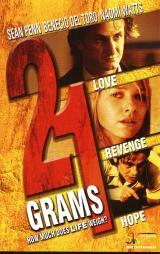 21 Grams, written by Guillarmo Arriaga (Amores Perros), explores the emotionally and physically charged existence of three people over a period of several months. An accident unexpectedly throws their lives and destinies together, in a story that will take them to the heights of love, the depths of revenge, and the promise of redemption.